She is seen as a parched skeleton, she is associated with healing, protection. Santa Muerte is particularly fond of liquid offerings, such as water and tequila. 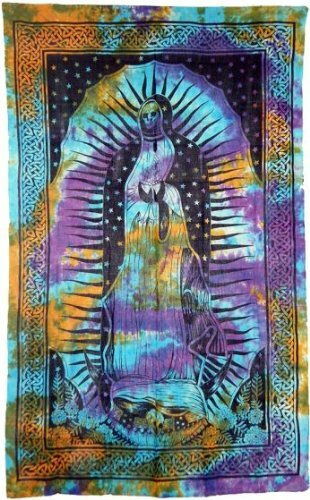 Her cloak can be of any color making this tie dyed tapestry unique, appropriately fitting. The colors of Saint Death votive candles and vestments are associated with the type of petitions made. White is the most common color and can symbolize gratitude, purity, or the cleansing of negative influences. Red is for love and passion. It can also signal emotional stability. The color gold signifies economic power, success, money, and prosperity. Green symbolizes justice, legal matters, or unity with loved ones. Amber or dark yellow indicates health. Images with this color can be seen in rehabilitation centers, especially those for drug addiction and alcoholism. Black represents total protection against black magic or sorcery, or conversely negative magic or for force directed against rivals and enemies. Blue candles and images of the saint indicate wisdom, which is favored by students and those in education. It can also be used to petition for health. Brown is used to invoke spirits from beyond while purple, like yellow, usually symbolizes health. In addition to the candles and vestments, each devotee adorns his or her own image in his or her own way, using U.S. dollars, gold coins, jewelry, and other items. A fantastic accent for decorating your sacred space, 72" x 108" 100% hand-loomed cotton. This tapestry can be used for a wall hanging, a tablecloth, a bed spread, furniture throw, curtains, altar cloth, hung from the ceiling, home decor, and more. If you have any questions about this product by Treasures Stones Crystals & More, contact us by completing and submitting the form below. If you are looking for a specif part number, please include it with your message.